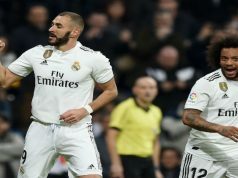 Karim Benzema and Cristiano Ronaldo handed Real Madrid a hard-fought victory in their first game of the new La Liga campaign against Cordoba. Los Blancos dominated the first half, but found goalkeeper Juan Carlos in a good mood. 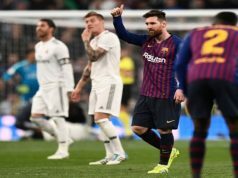 The Spaniard denied Toni Kroos, Sergio Ramos and Ronaldo in quick succession, while the Portuguese also headed wide early on. However, minutes later Kroos provided the assist for Benzema to score the opening goal. The Frenchman rose high to meet the midfielder’s corner to give Los Merengues a short half-time lead. Cordoba’s striker Mike Havenaar tried his luck with a brilliant header in a corner kick, but his effort failed to trouble Iker Casillas, who started in goal ahead of new signing Keylor Navas. As the second half got underway, the away side created two openings, but again Havenaar failed to hit the target, while Ryder Matos shot straight at Iker Casillas. Cordoba had a few more chances, but they made a mistake in the last minutes that ended their hopes of savaging a point. Isco stole a ball and handed it to Ronaldo, who drilled the ball into the corner of the net from 30 metres out to seal the points.